The little village of Denby Ash and the boy’s school at Ash Grange in Yorkshire are presently in a bit of turmoil. Roderick Braithwaite and Andrew Ramsden are pupils at the school, inhabitants of the village and best friends. At the present, Roderick’s home has been invaded by a poltergeist, and Andrew’s father, a police inspector, is currently making himself unwanted because he’s investigating the disappearance of a hometown embezzler and his cell-mate, recently released from prison. Bertram Browne, a teacher at Ash Grange, is in the process of putting together a musical version of Dr. Faustus, which is calling all kinds of disapproval from the Christian dwellers of Ash Denby, of which there are several denominations, so much so that Roderick and Andrew consult the local witch, Ivy Neal, about a possible exorcism. Upon visiting his star pupil, Mr. Browne has the unfortunate opportunity to come face-to-face with the apparition. A few hours later, more unfortunately, he is killed in a hit-and-run accident. . . .
. . . and that brings Albert Campion, his wife, Lady Amanda, his actor son Rupert, and Rupert’s bride Perdita, onto the scene. Brigham Armitage, headmaster at Ash Grange school is Perdita Campion’s godfather, and he thinks she’s just the one to take over the late Mr. Browne’s classes and finish directing Dr. Faustus. As an extra enticement, he also invites Rupert to take over Brown’s coaching position at the school, and further settles the matter by asking Lady Amanda to make an appearance and hand out awards. Mr. Campion simply comes along for the ride, and is soon “assisting” Inspector Ramsden. “I understand this local criminal, Bagley, was released not long ago,” said Mr. Campion thoughtfully. Mr. Campion’s discoveries bring the missing to light and “lay” the poltergeist to rest, but not in the ways expected. The mention of events such as the opening of Hair in London and Richard Burton’s appearance in the movie version of Faust, sets this story in the mid-sixties. There are some British phrases and words that may confuse American readers a bit, such as kip for nap, but the context should assist in understanding them. 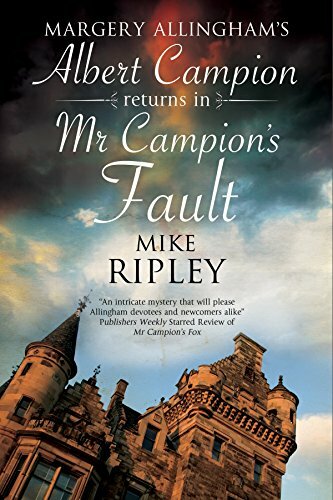 Mr. Campion's Fault is a definite tribute to Campion’s creator author Margery Allingham, with its neat turns of phrase, and narrative-type descriptions, nostalgic and definitely entertaining.